Grandma and grandpa left almost a week ago and I miss grandma and our early morning coffee together in the front room looking out upon the lake. Ivy’s curled up on her pad almost as if it is her nest, sleeping. I got up much earlier and it was cool, crisp, and clear I decided to sit out on the deck and invited Ivy to join me, she decided to stay inside and curled up and went back to sleep. W and O are still sleeping and they need it. 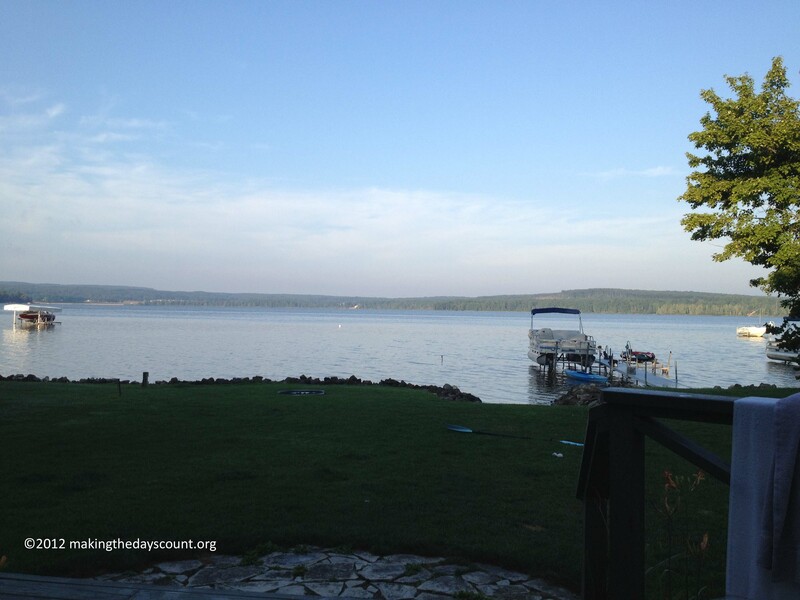 A day here is full of activity – swimming, playing, and being a kid. They have friends here along the lake and one family went home around noon, they’ll be back this weekend for the race, the annual canoe marathon down the Ausable River. After chores in the afternoon, they played in the lake with Ivy and another set of friends from down the lakeshore. I got out midday for a walk and errands; it was hot, humid, and I should have known doing chores, midday without a shirt would lead to a mean sunburn, but I wasn’t thinking it would happen so quickly. But, it did. We did finish weeding and cleaning the shoreline and the sandbox is clear of weeds for now. I am sure weeds will pop up again; it is the nature of weeds, the cottage, and any other place outdoors. We had dinner and W cleaned the kitchen, while O and I planned our fishing adventure. She’d been asking to go fishing and I had been putting it off, putting her off; it was too rough, the boat didn’t work (true, it was on the fritz), it was too late, and too many other lame excuses. She likes to fish. 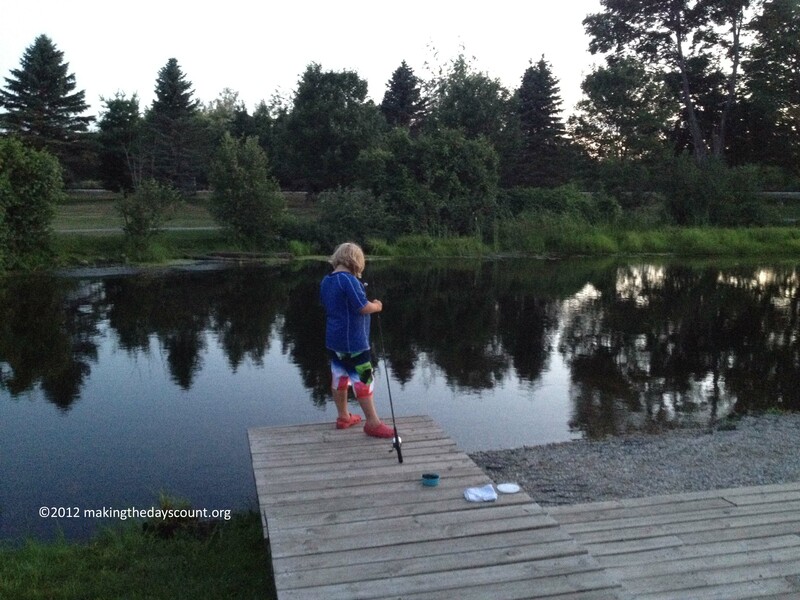 I rigged her line for fishing – a hook and a bobber for pond fishing and we drove over to the pond. When we arrived, we were disappointed the pond we remembered was more of a swamp than pond and I suggested we try fishing in the river. In town, there is a pool along the river just before the dam and it is perfect for fishing, especially for kids. O baited her hook, actually, I baited her hook with a worm and she tossed her line into the water. She immediately got nibbles and was excited. But, her line was rigged for pond fishing, not river fishing and all she did was feed the fish. As she fished the crescent moon got brighter and brighter as the day and daylight ended, we packed our gear and headed home, but not before, we stopped at the grocery for ice cream to go with our blueberries and strawberries. It was quiet along the lane, and dark. W pulled in behind us on his bike when we got home and we enjoyed our berries and ice cream while watching a baseball game on TV. Berries done and kitchen cleaned it was time for bed. Even with my mean sunburn, I was asleep before I knew it. Today brings a calmer lake and great opportunities. I can feel my back, it’s warm and tender, but I’m not gonna let it slow me down. Today is gonna be a great day, so I’d better jump up, jump in, and seize the day. I don’t want it to pass me by. Making the days Count, one day at a time, even one simple thing at a time. Do your recall a summer sunburn, did it slow you down? 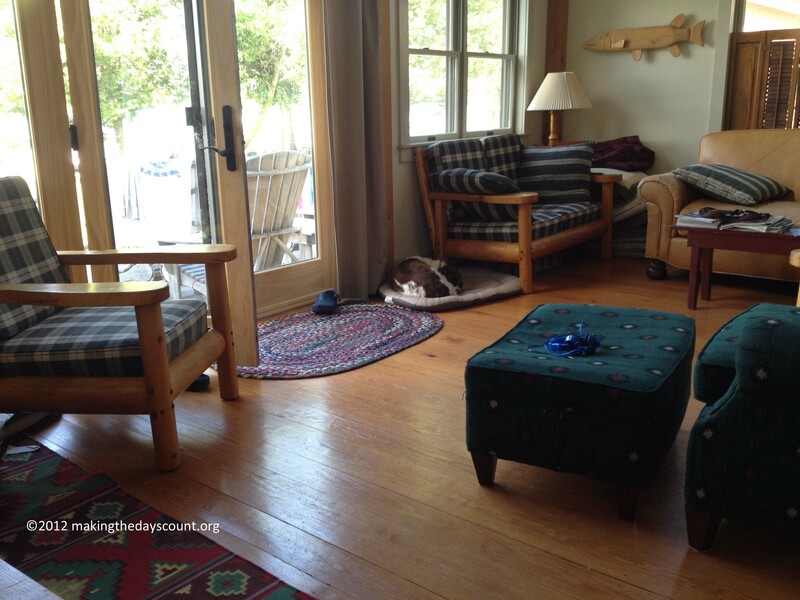 At one time, it was our dream to one day own a cabin on a lake in WI or MI, but then we moved out west. And out west “whiskys for drinking and waters for fighting over”. It’s rare to be able to own lake front property as most lakes are reservoir needed for drinking and irrigating and thus government owned. thanks for stopping by, I am enjoying your ventures as well. Growing up without a place to go, we played in the neighborhood and took occasional trips. The Midwest, like all places has it selling points and the stuff you have to hide, to make the sale!